opportunities for solitude and primitive, unconfined recreation." Solitude? 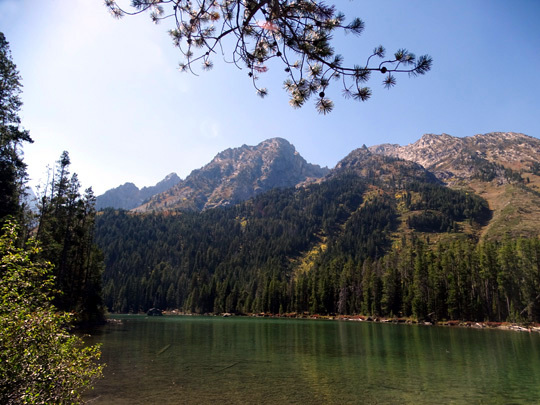 I found that Thursday on the other side of the Tetons in the Jedediah Smith Wilderness but we are hard-pressed to find any solitude on the national park side of the mountain range this time of year. I've been on some of the remote national park trails that do offer some solitude and they are magnificent. However, there are so many people in the developed part of the park right now that it's near-impossible to find a place to camp. Maybe we'll try again another year . 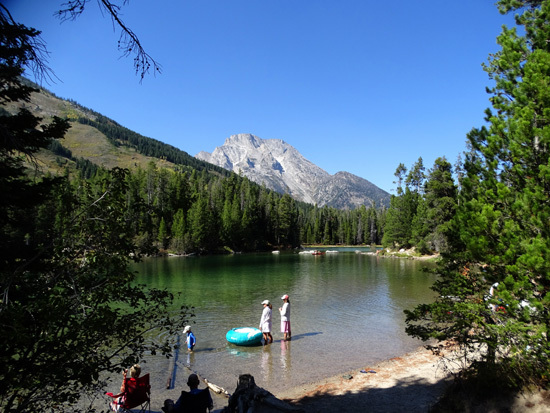 . .
Today was beautiful again on both sides of the Tetons -- 41 to mid-70s F. at Reunion Flat Campground, sunny, not much wind, very dry. 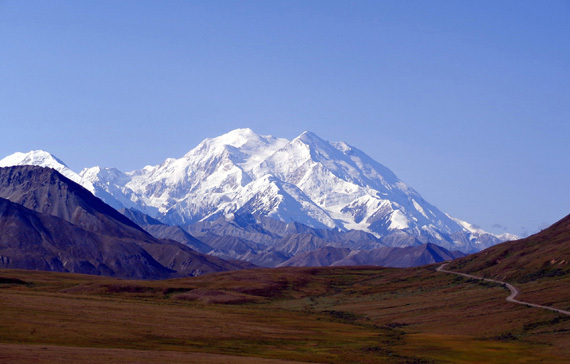 I was still too tired from Thursday's Alaska Basin trek to hike up to Table Mountain. 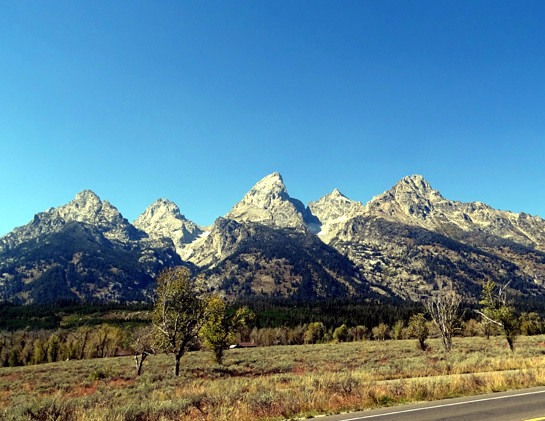 We ran errands down in Driggs in the morning, came home to eat lunch, and then Jim suggested we drive over to Grand Teton National Park on the other side of the mountain range. 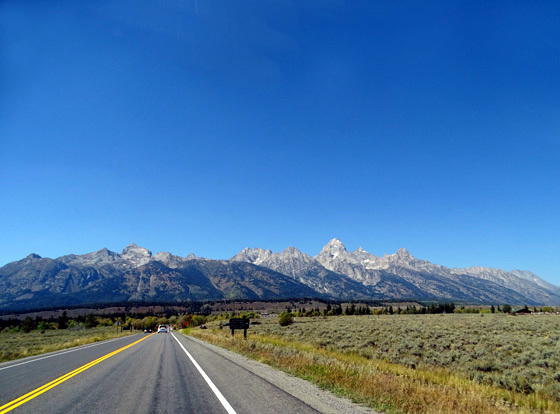 It's not that far to drive around the southern end of the Tetons on ID 33 and WY 22 to US 89 and up through the park. We were back home by suppertime. 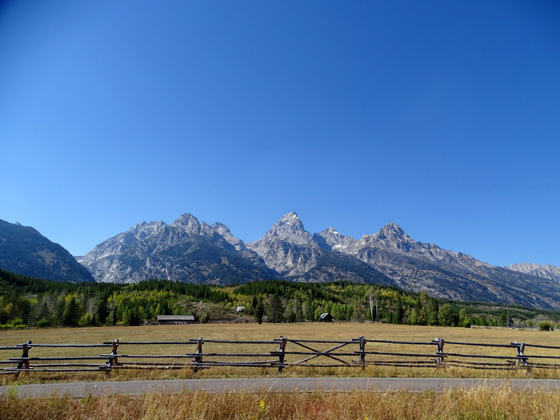 When we were originally planning our fall migration south from Alaska to Arizona we were hoping to spend a few days camping at Gros Ventre Campground in the southern part of Grand Teton National Park. We enjoyed our visit there two years ago and wanted to do more hiking and cycling in the park. 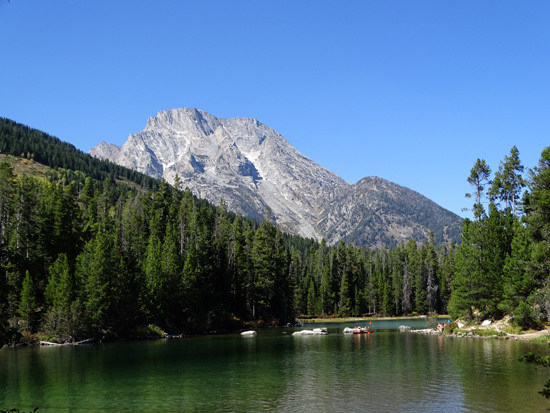 We've been reading, however, about how many more people are RVing this year and how crowded campgrounds are, especially in popular national parks like this one. In addition, the National Park Service is heavily promoting park visitation because next year is its 100th anniversary. 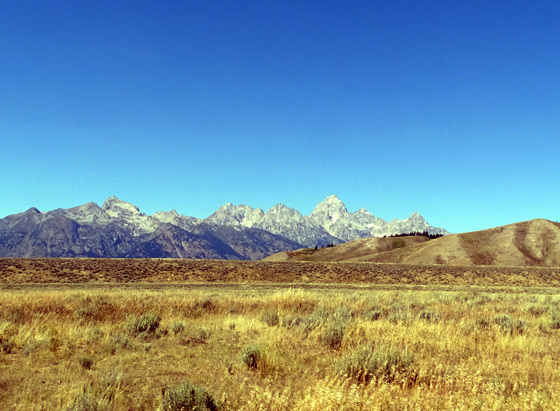 Cluster of Teton's highest peaks -- South, Middle and Grand Teton, Owen, St. John, Moran, etc. 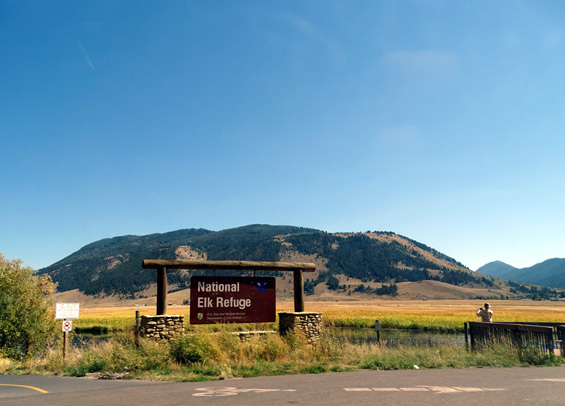 We know from having camped at Gros Ventre previously that sites are limited for big rigs -- as at many public parks -- which reduces our chances of finding a suitable site on a first come-first served basis. Most of these sites fill quickly early in the morning as soon as other RVers vacate them because folks are waiting outside the entrance like vultures. We hate doing that. 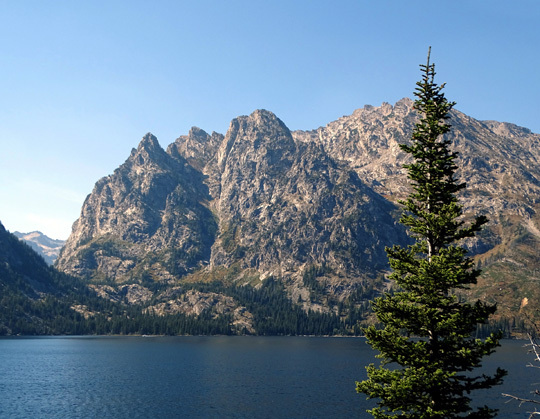 Today's scenic drive from the west side of the Tetons to the east side was partly a scouting trip to see how full the park campground is and to ask what our chances would be of finding a site on Sunday or Monday, after the weekend crowd (hopefully) dispersed. We knew the campground would be full today so we just drove the car over there. Above and below: A nice bike path connects Jackson Hole with Jenny Lake in the park. Our plan kept morphing when we realized it would be difficult if not impossible to get a site at Gros Ventre. 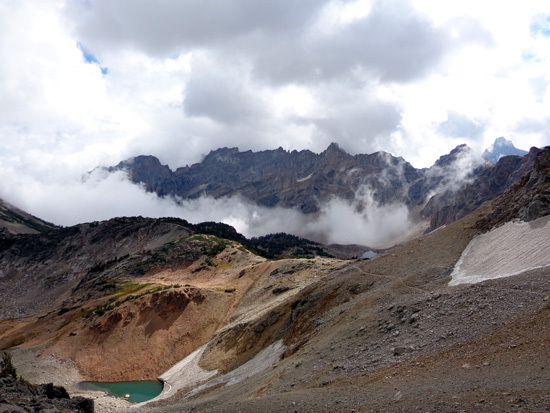 In addition, the weather forecast isn't favorable -- rain is now predicted on both sides of the Tetons and down at least as far as Salt Lake City from Monday afternoon till Thursday. So now we've decided to leave the area soon. It wouldn't be any fun camping next week at either Reunion Flat on the west side or Gros Ventre on the east side, especially with no hookups, TV, or WiFi at either campground. Hiking and cycling aren't any fun in the rain, either, when you can't enjoy or even see the fantastic scenery around here. The current plan is to forfeit one night at Reunion Flat (only $6 lost) and head toward Salt Lake City tomorrow while the weather is still nice. Jim called and got a three-night reservation at the RV park at Hill AFB, where we stayed a week in 2010. Even if it's raining at least we'll be on a concrete pad and have full hookups, WiFi, and TV. 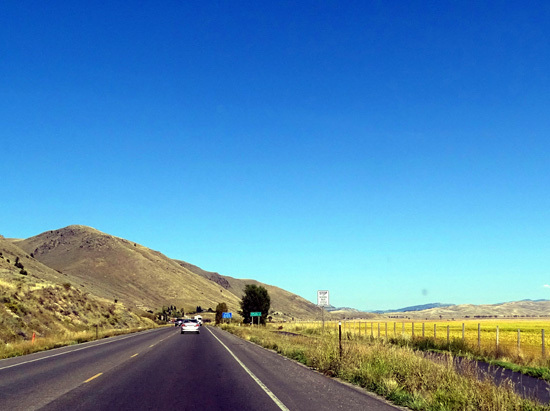 We'll take two days to get there via a very scenic route on US 89 past Bear Lake. 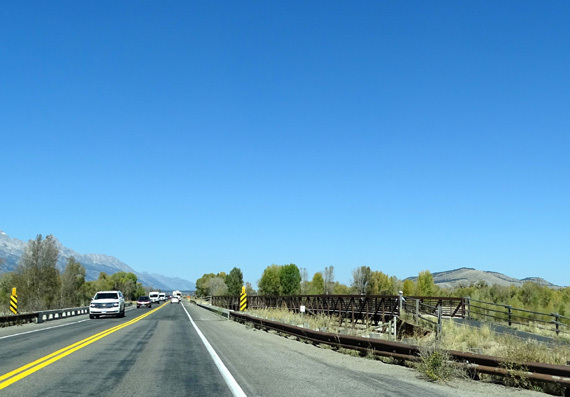 Hence the drive over to the park today -- so we could see it on a pretty day and see how crowded Gros Ventre CG is in case the weather forecast miraculously changed from this morning! 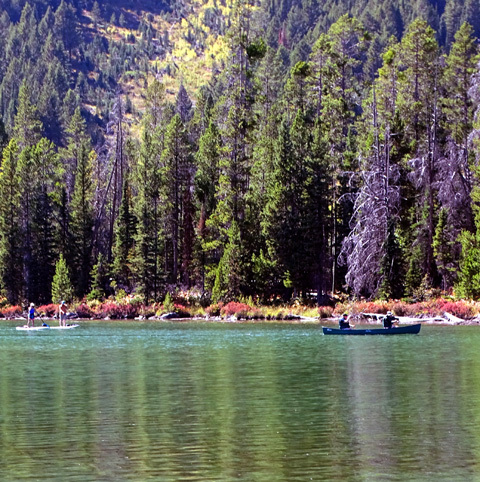 Two paddle-boards and a rowboat -- looks like fun! 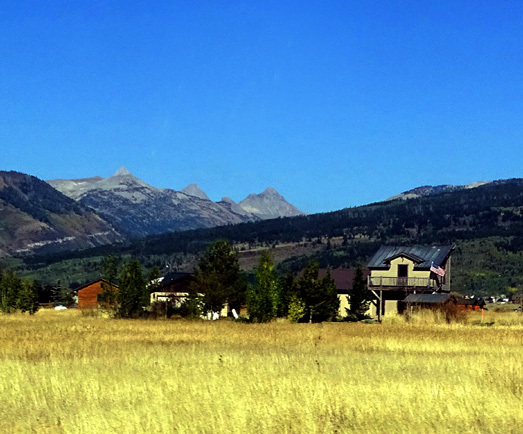 Hardly any flowers are left, the grasslands are mostly dull brown, the aspens haven't changed color much, and there's virtually no snow (or glaciers) on the mountains this fall. It'd be prettier either earlier or later than now -- and after a year with more rain and snow. So I'm OK with leaving earlier than planned, just disappointed that our timing was off this year and so many other people are in the park after Labor Day. We'll just have to hunt for other places with nice scenery, great trails, and fewer people!